When Pamela, Amanda and I were in Charleston a few weeks ago we realized that we all packed some sort of geo print to sight see!! With all of us deciding on a different way to wear the trend (maxi & skirt), we thought it would be fun to highlight how we each interpreted it. I went with a romper that I scored from Marshall's two days before our trip - price tag $10!! You just can't beat that!! The reason I loved this romper was that it was light weight, breathable and you couldn't see me sweating through it - since it was arguably the hottest day there. Funny enough I usually find that when I wear shorts they ride up, but this romper stayed in place and since we were sight seeing all day the bathroom breaks were limited so that whole issue of taking the romper off didn't come up much! What else made this outfit so perfect was the cross body bag and the gladiator sandals - that I literally tore through. Not having to lug a bag with me on my shoulder was the best thing I did for myself. My Anne Klein Fit Watch nearly had to be recharged every night with how much walking we were doing and again I can't even tell you what a great investment this watch was because it matches all my outfits effortlessly without looking like I'm wearing a fit watch! Bracelet & Necklace Gorjana I snagged the purse during the last sale that Gigi New York was having and sadly they are no longer making this bag - but this one is another good option. To me a great sight seeing outfit in the Summer is light weight, easy to pack and breathable. The shoes are always important since you'll be doing a lot of walking and of course you want a purse big enough to hold the important stuff, but small enough that you dont feel like its a nuisance - which is why a cross body is always my first choice. And because I love a good outtake - I leave you with this beauty - not even sure what I was laughing about but it must have been good! What do you find yourself gravitating towards when you sight see? P.S. the coloring is a bit off in the pictures - I promise I'm not actually orange! Absolutely gorgeous! I don't think you look orange at all! And I still can't believe that romper was only $10. Love that last pic! I don't know what we were laughing at either but I'm glad I caught it on camera! Such a perfect look! Rompers are such a fun trend and i love how you've accessorized it... almost as much as I love the fact that you're incorporating more fashion posts! I love that romper - and the price! Wow! Rompers are so comfy. And I'm wiith you, while sightseeing a crossbody is a must! SHUT UP that price tag is FANTASTIC! I love the way you styled it, that crossbody bag is everything! Major Score! Major Beauty right there!! You look cute as a button and ready to tackle the city! 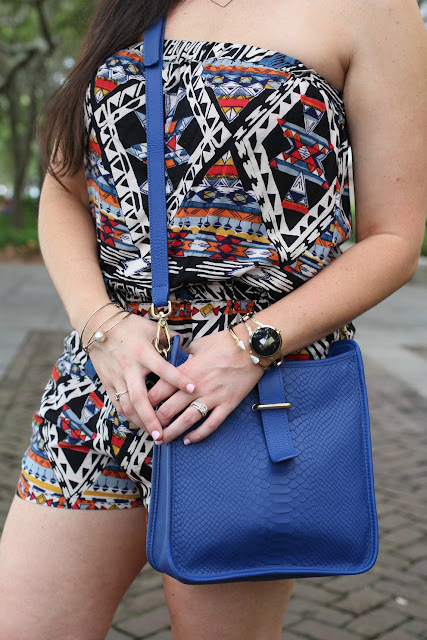 That Romper is gorgeous as can be and that amazing bag really makes it pop!! Let's talk about those sandals too....perfection!! Have a fantastic Tuesday gorgeous!! This is such a cute romper! I love the print and that bag is too cute! Such a great $10 find! The laughing pictures is so cute! A comfy romper is perfect for sightseeing! The bright blue bag is so gorgeous!! Such a cute romper and what a steal at $10!! You look adorable and comfortable which is key when walking around all day. I love the romper and the price tag! It's great when you come across great deals- puts an extra pep in your step! Wow 10 dollars!! Such a great find! I always worry about having to take rompers off to use the bathroom as well, I'm glad it worked out that you didn't have to take it off much. I just bought my first romper.... and I'm not going to lie, I'm totally excited about it! These colors look great on you and it seems like the best way to stay cool in the south! Well done! Best $10 purchase EVER! personally i think the last photo is best. love me a good candid! i threw some in yesterday ha. anyway i love that romper. i'm deathly afraid of them bc i feel like i'll look similar to a beached whale. so i just let pamela rock them for me. ha! but you look super cute! and i can't even imagine how hot it must have been! you look gorg!! I only have 1 romper that fits me well. the price tag on yours is the best part!! the worst idea is wearing a romper out at night and having drinks= having to use the bathroom a lot. a huge nightmare!! Omg you're the cutest!!! Love this romper and you can't beat the price!! It's perfect with the bright blue bag! Love!! How have I never seen this watch? I want a FitBit but feel like it looks dorky...this does not! I think your outtake was the best pic of the whole batch! And I know this post is about the romper, but I LOVE LOVE LOVE the sandals! Where are they from? I want those in my life! The loving romper! Styled perfectly too - esp with the blue purse! This is really cute! Love it! I like things that are super comfy, stylish and easy to move in. A romper always fits this description! Love it! perfect for charleston! and $10, that's crazy!! what a steal! love it. Love this romper, and for $10?! That's a no brainer! Such a steal! $10? I'm sold! I love these pics!! Girl, you are gorgeous! LOVE the romper and the fun print!! Love this geoprint romper, I can't believe you got it for $10. What a steal! It looks so perfect with the GiGi bag! And I totally agree, rompers are so cool and comfortable -- perfect for a day of sightseeing! You look gorgeous!! That romper was made for you. You look so pretty! 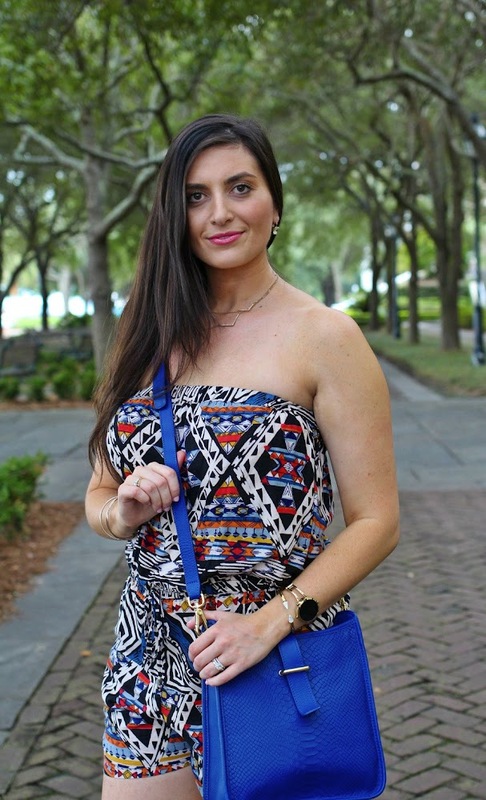 I love the print on that romper and the color of your bag! I'm totally a romper girl when we are going sight seeing or even a stroll through town. I love dresses, but those unexpected gusts of wind aren't the best for modesty. (; I too found an awesome romper at TJ Maxx for $25! Not as great as a deal as this one, but I was still proud of my find. I've worn it so many times this year. It's just so easy! I love a good crossbody when I am sight seeing...so much better than lugging my huge purse around. Super cute romper, pretty lady! Loving it with the cobalt bag- what a stunner piece! I have to say the last picture is my favorite!! You have such a great smile! :) And love this romper. I have yet to brave getting one because of the whole bathroom issue ... but they look so much more comfortable for when it's super hot than my normal shorts/tank combos. Do you think it's worth it?! I love the outtake!! Happy girls are the prettiest! I love that romper only cost $10! Such a great snag!! Only $10?! What an awesome find! Love this pretty print for sight seeing!! Seriously, $10? That's amazing, and I love your style. I also have to agree about not seeing those sweat lines, especially in Charleston ;) haha! You look great, I can't believe the price tag on this romper! You paired all the accessories so well with it, too. That looks so comfy & cool! You look FABULOUS, lady!!!! Love the way the purse watches your outfit. You look so cute! Cannot beat a 10 dollar deal! That romper is adorable and such a steal!! I can't believe you got it for $10! It looks perfect with that gorgeous bag! What a cute romper and even better with that price! Such a good steal! A cross body is definitely the way to go when sightseeing - it's the only style purse that I'll take with me when I go on vacation. That romper is adorable but it's the bag that caught my eye! Such a pretty pop of a color to be a tourist in! Super cute and that bag will transition to fall too! So cute! Comfy yet chic!!! Love it! I have a similar romper that was just as inexpensive at Target. Love it! Love this outfit post - would love to see more! You are stunning! And of course, loving the romper! What a major score!!!! This romper looks fantastic on you! I love the colors/print. I am with you on finding something that is breathable and doesn't show sweat. My constant worry all summer long with these out of control temps and humidity! I forgot about that fitness watch you have. that is one huge downfall with the fitbit, it is not cute! you don't look orange at all! lol. this is an adorable romper, and what a bargain! i totally agree though, the best sightseeing outfit is comfortable, breathable and easy to pack! i used to love my crossbody bag (yours is super cute) but in europe i started wishing i had a small backpack (how unfashionable lol) because it would start to hurt my shoulders / back from uneven distribution. am i getting old?!? I am really loving the bag and sandals! Cute print and super comfortable and airy outfit to walk round a new city and explore. Love the pop of color from the purse. A good crossbody purse is a must for traveling and touring! This is adorable Biana! Looks so comfy too. You look so cool and comfy! I love it! Whaaat, $10?! What an awesome find-- love rompers and this is such a fun print! You look gorgeous!! I absolutely LOVE rompers and will wear one any chance I get. They are so lightweight and I love that the fabric doesn't stick to me like a shorts waistband would, but I don't have to worry about them flying up in a gust of wind like I do when wearing a dress. And this one you picked is awesome!! love that pattern! I LOVE that romper, and the blue bag really makes it all pop and come together! Beautiful! Love that romper! It def looks perfect for a hot day. Also love the blue color of your bag. So cute! Marshalls is the best (besides TJ Maxx, of course :) ) Great find with the romper - I'm sure Charleston was ridiculously hot this time of year. But it's such a great city that it's easy to ignore! I love rompers since they are so stylish and so comfortable to wear. AND at $10 that's a definite snag! So cute! And what a score at only $10! That SC heat is brutal so sweating through an outfit and not being able to see it is probably one of my favorite parts!